Do you know moments of spontaneous happiness, unbidden freedom and wholeness? Would you like to understand them and give them more room in your life without becoming “Eastern”? Then the original and modern Being Orientated approach developed by Hans Knibbe can offer you a wealth of insight and methods. Hans Knibbe has combined his training as a psychologist and his dedication to Dzogchen into an accessible and practical path of the art of enlightened living. 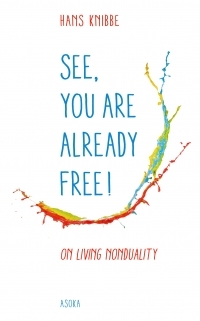 In this book, he concentrates on the recognition of the free, nondual ground of our being and shows how we can continue this recognition in our everyday lives. As you read it, the book has the potential to awaken your enlightened nature in such a way that you will gain an inner understanding. In that sense, it is as much a study book as a meditation-inspiration book. A clear, very readable book about a very difficult subject. It is about the essence of spirituality. This is a book that should not just be read, but above all be lived. That is the appeal with which Knibbe ends his final chapter. I am especially grateful to him for that. Hans Knibbe (1949) is the founder of Being Orientation and spiritual leader of the school for Being Orientation, which he founded in 1987. At this moment, his work consists of giving retreats, workshops and supervision.